These are the kind of financial entanglements that intelligence services such as the FSB typically use to ensnare foreigners, and they could leave Trump vulnerable to blackmail. — Once in office, Trump fired Comey to stop the investigation of the “Russia thing” — and then bragged about having done so to the Russian ambassador and foreign minister while also sharing with them top-secret information. . . . . Trump has been effectively protecting the Russians by trying to impede the investigation of their attack on the United States.— Trump has refused to consistently acknowledge that Russia interfered in the U.S. election or mobilize a government-wide effort to stop future interference. — Again, like no previous president, Trump attacks and undermines the European Union and NATO . . . . The E.U. and NATO are the two major obstacles to Russian designs in Europe. 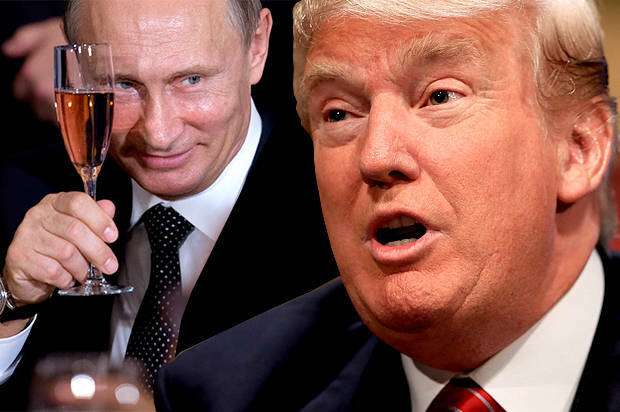 — Trump has praised Putin (“a strong leader”) while trashing just about everyone else from grade-B Hollywood celebrities to leaders of allied nations. — Trump was utterly supine in his meetings with Putin, principally in Hamburg and Helsinki. Even more suspicious, according to a Post article on Saturday, Trump “has gone to extraordinary lengths to conceal details of his conversations with . . . Putin, including on at least one occasion taking possession of the notes of his own interpreter and instructing the linguist not to discuss what had transpired with other administration officials. . . .
Now that we’ve listed 18 reasons Trump could be a Russian asset, let’s look at the exculpatory evidence. . . . I can’t think of anything that would exonerate Trump aside from the difficulty of grasping what once would have seemed unimaginable: that a president of the United States could actually have been compromised by a hostile foreign power. The pee pee tape may be real or may be not, but what’s certain is that Vlad has Kompromat on Cheeto and he wise it.